It takes a lot to be considered a horror film. At least for me. At first, I wouldn’t call a movie a horror if it wasn’t scary…the problem with that is that I don’t scare easily. So to determine if a movie is scary or not, I usually look if they hit on a specific and common fear that people have – darkness is a common one. I then see if it’s unpredictable, because the biggest part of a horror film that people don’t always understand is the anticipation. The unknown. The suspense. The list goes on and on, so when I heard about The Bay, I had to check it out, as it is done in the found-footage capacity. I don’t know if I can call The Bay a horror, or even found-footage. I don’t know what to call it. We have news reporter Donna (Kether Donohue) as she reports what happened in the Chesapeake Bay area on an Independence Day weekend celebration. She does this through various film clippings that she and her team have come into contact with…somehow…then edited them together in order for the audience to see the process of events in clarity that the media cannot report on. Basically, on an Independence Day weekend, the civilians of a small town nestled on Chesapeake Bay begin getting sick. Blisters and boils start showing up on their skin, and all signs point to the infected waters of the bay. No, this is not an eventual zombie movie of any kind, or mutant redneck people, nothing like that. No…it’s just…sick people. The common fear people may have is clearly ecological, fearing how fresh our waters are, or how corrupt and uncaring our government is towards the environment. Ooh…scary.. Ladies and gentlemen, this movie doesn’t hit on any real scary moments, instead it hits on more of a scary thought, and only a scary thought. You’d expect to see this sort of thing in a future-predicting eco-activist documentary. That’s it. If that’s your type of thing, check out this film, for those expecting more, look elsewhere. This film was produced by the same people as Insidious and Paranormal Activity, but that really doesn’t mean anything, does it? Oren Peli produces a lot of horror films, but his writing is what made Paranormal Activity so good. The other films in the series were also produced by him, but those weren’t very good. So what he has given us this time around is a big…ecological scare that hits home with almost no one but eco-friendly activists. I also said that I wouldn’t call this found-footage…why? 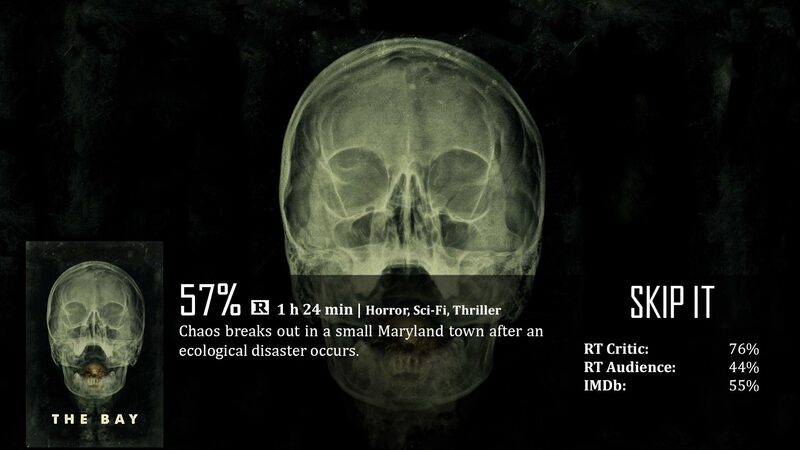 Well, found footage is usually shown, presented in a way that makes it look raw and unedited. That’s why a lot of these found-footage films begin with something like, “The following footage was found by a couple taking a walk fifty miles away from the crime scene. The tapes are unedited to expand on the reality of the circumstance”. They pull an audience in, connecting them with the film. This is done like a news report, which I kind of get, but at the same time, an audience can’t connect with it any more than an everyday news report. It’s edited together and uses music at tough scenes. Why? Well music is a fantastic tool to force emotion from the viewer, but it just seems fake in found-footage. Unless the music is playing on a physical boom box, of course. The Bay utilizes some interesting visual concepts, but overestimates its ability to scare. You’ll instead wish the movie would end, because its execution begins to dawn on you…that it’s really not all that great. The biggest threat is egological…which isn’t a really entertaining topic. If it’s your thing, check it out…if not, just forget it. I could never decide whether I want to see this or not. You made it much easier for me. I leave it alone! Thanks for this review. Good Job!